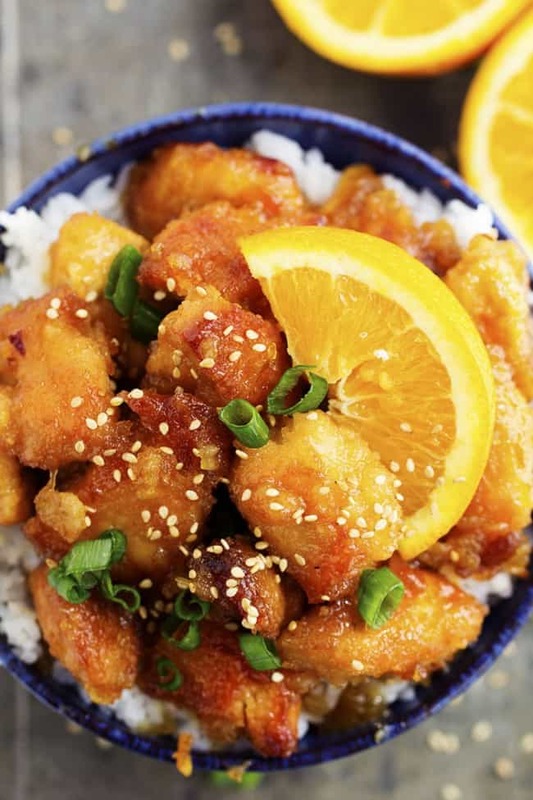 A delicious and tangy orange chicken that is made right in your slow cooker! This is better than takeout and a meal that the entire family will love! I love two things a whole lot in this world. My slow cooker, and chinese food. So whenever I make something that has to do with both of those things, I am in heaven. With the added outside breading, it helped to thicken up the sauce. The breading soaked up all of the amazing flavor. My now 7 year old who has been eating it since he was 4, gobbles this down every time. And he is such a picky eater. If he loves it, then I am convinced your family will too! A quick and easy slow cooker meal that tastes just as good as takeout! In a bowl mix the rice wine vinegar, soy sauce, sesame oil, marmalade, brown sugar, salt and pepper. Set aside. In a ziplock bag, add the cornstarch and chicken. Shake to coat. Pour vegetable oil in the skillet and brown the sides of the covered chicken. The chicken doesn't need to be fully cooked since it is going in the crockpot. After the chicken is done cooking, pour the pieces into the crockpot. Then cover the chicken with the sauce mixture and give the pot a stir. Cook on low 4-5 hours or high 2-3 hours. yum this looks so good AND easy! can’t wait to try- thanks! I recently tried this recipe too! I did not have enough ketchup so I submitted with sweet and spicy BBQ. It gave it just a little extra kick. Was delicious! Oh my gosh YUM!!! I will have to try that! Thanks! Hi Alyssa! I am a new follower – thanks to your visit! I can hardly wait to ‘blog stalk’ your site. Your photos are FANTASTIC! 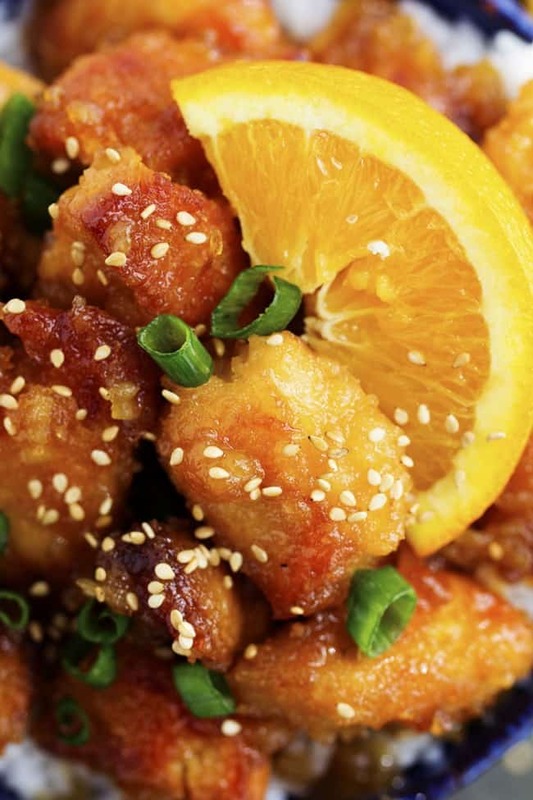 My husband goes crazy for orange chicken, I need to try this one! Thank you so much for this fantastic recipe! We LOVE chinese in our house, but I have not had much success making many of our favorite dishes at home. I do make a killer chicken fried rice though, LOL! I will be giving this a try very soon! Trying this one over the weekend, just got a new *larger* crock pot (yay!) and this looks amazing, thanks for sharing! I love the idea of your site! So often I find recipes that look pretty good, but could go horribly wrong (and some have….please don’t ask about the sauteed butternut squash recipe). This looks delish and I will definitely be back on a much more regular basis! Thanks! Love your site 🙂 I tried this and it came out super orange-juicy, way too much for my families taste. Do you think the brand of concentrate might make a difference? It was just over powering, sadly 🙁 But its the only recipe that hasn’t been awesome that I’ve tried from here! That is really strange because my sauce was pretty thick and the orange wasn’t over powering at all or I don’t think my family would have liked it including me… this is my pickiest favorite meal and asks me every week to make orange chicken. 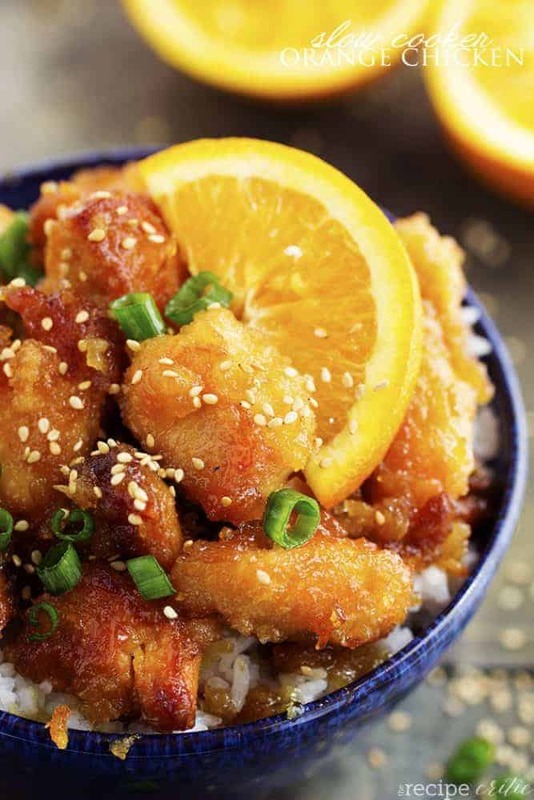 You might just want to half the orange juice concentrate if you make it another time… or if it is the orange in general then try my sesame or teryiaki chicken recipe! Those are amazing as well! Hope this helps! I hate when things don’t turn out as expected. Hi there! This looks great and I plan on trying it tomorrow. 2 things…do you think adding veggies would diminish the dish? Perhaps red bell peppers or carrots? And if I prepped it the night before, do you think the chicken will be ok after fried and cooled to be stored in the fridge? I tried and LOVED it!! I did add a chopped onion and a green bell pepper to the top of it in the crock pot. Also, about 30 minutes before it was done, I added three bags of 10 minute boil in a bag rice (out of the bag) and added about 2 cups of chicken broth. It made a great one scoop dinner without causing more dishes. My husband said that it had, “too much lemon” which was funny given that there is NO lemon. He continued to eat every. single. bite. Thank you for this recipe!! Made this tonight for dinner (cut in half because it was just for 2 people) and although it was cooked perfectly and pretty tasty, I felt like it was just kind of a one-note flavor: ORANGE. The concentrated juice, plus sweet ketchup, plus brown sugar, plus balsamic, just made it way too sweet for my liking. Although it was already done cooking, I ended up adding more salt, lots of pepper, some garlic powder, a little soy sauce, and some chopped green onions. The savory flavors did wonders to balance out all the sweetness and our leftovers were much tastier with the added spices. Just my experience with this one. The real value of this recipe is the cooking method – flouring, browning, and then finishing in the crockpot. Now I am excited to try this technique with other sauces! This technique, paired with any good asian flavored sauce, will be fantastic! I cut the orange juice concentrate in half for this recipe like other suggested and it was still too sweet. It literally tasted like orange juice concentrate. I added a few cloves of garlic, some ginger, soy sauce and honey like others suggested on the original recipe but the orange flavor still dominated this dish. I added some red and green peppers in the dish for color and so I didn’t have to make a veggie with it. Would not make this again. Does it has to be concentrate? Can I use fresh orange juice? hi, it seems the recipe ingredients above are different from comments I’ve seen. The above recipe does not mention anything about orange concentrate nor ketchup. Have some ingredients been omitted on this page? I don’t see ketchup or juice concentrate, are we seeing the same recipe? I just discovered this recipe, and it’s currently sitting in my slow cooker. Can’t wait to try it! However, when I tried to mix the raw chicken and cornstarch in a ziplock bag, the chicken ended up clumping together and the cornstarch wasn’t evenly distributed. Should I have washed and dried the chicken before this step? It was difficult to brown in the pan because they were stuck together as well. Thanks! read the comments, people talk about ketchup and orange concentrate and non of these are an ingredient in this. Really confused?…. I made this for dinner tonight and it was so delicious! Way better than takeout and so simple to make. I will definitely be making this again. Thank you! I made this Orange Chicken recipe today & while it tastes absolutely beautiful I found that it was almost burnt after 3 hours on low in the slow cooker. Luckily I saved it just in time, with only a couple of bits starting to burn. My cooker does seem to be fairly hot compared the slow cookers of old so perhaps that was the reason. I would advise keeping an eye on things the first time you try this recipe just in case. Apart from all that it’s going to be a keeper & I can see myself making this gorgeous dish quite frequently. PS I added a clove of crushed garlic & 1/2 tsp of ground ginger to the sauce. First of all – ONE STAR!!!!!!! – IF YOU TRY TO RATE THIS RECIPE, IT WILL -NOT- ALLOW ANYTHING LESS THAN 5…SCAM!!!!!! PS: Im a pitmaster, and have been cooking fairly complex dishes for 2 decades. Just an FYI to the other recipe-goers. Dee I am sorry it didn’t turn out for you. But other people have been commenting saying that the recipe is delicious and better than takeout. So something had to go wrong on your end. The picture that I used is the exact same recipe. I would never just copy and paste and make and photograph every single recipe that goes onto my blog. I’m hoping to try this recipe tomorrow! I was wondering if high use toasted sesame oil or the regular light coloured one? I’m hoping to try this recipe tomorrow. I was wondering if you use roasted sesame oil or just the regular light coloured one? I just used regular sesame oil. When you say t or T in recipe is it tablespoon or teaspoon??? Don’t know why others aren’t asking. It cd make a difference!! What does t or T mean? standard recipe abbreviations are T=Tablespoon; t = teaspoon. Ugh. I hate to alter recipes but the store literally had every kind of oil but sesame. Do you think I could use olive oil instead?? you could use olive oil, but i would probably use a more neutral one like canola. When cooking chicken in the pan first can I also dip the pieces in egg before browning? I have tried it this way but I feel like the breading got a bit soggy with the egg while in the slow cooker. why do some of the earlier comments refer to orange juice concentrate and ketchup? Did the recipe ingredients change? You indicated on February 1st, you were going to update the recipe, to indicate what “T” means? It is not updated. Also the picture shows green onions, the recipe does not call for green onions? The cornstarch does not bread the chicken, it ended up coming off but did help to thicken the sauce. I probably would had tried the original recipe that had the orange concentrate and ketchup that so many people loved, but apparently the new recipe has not been reviewed. Strange that you would do that….. even stranger that only a 5 star rating is allowed. Yea… fishy smelling scam…. Going to try this tonite, will probably add some red and green bell pepper, and some sliced carrots. Wondering why everyone is talking about orange concentrate when the recipe clearly states orange Marmelade….. BIG Difference! And I don’t see ketchup anywhere in the original recipe either…. I read ALL the comments before making this dish. I’m not going to comment on the ingredients as I adjusted to suit our taste. As for the methods, I found that adding the cornstarch 1 T at a time combatted any clumping. Because I brine my chicken before cooking, I dried my chicken well before the dredging step. I also chose to cook my chicken for significantly less time…2.5 hours on low and then 30 mins on high to thicken the sauce a little. With these adjustments, we really loved this meal! Will definetly be making again! Kristen–thank you for your advice and insight. I know this helps out many of our readers! I love to read the interactions that happen between our readers and so often I learn something which is GREAT! I made this in my Instant Pot with brown rice, and it was absolutely fantastic! Thank you for a great recipe! Just finished this for dinner. We loved it! Nice and easy. My grandkids liked it as well, and they are picky. Cooked up some rice, broccoli and carrots to go along with the chicken. I didn’t have orange marmalade so I substituted no-sugar-added apricot jam. I left out the brown sugar and it was plenty sweet. I added some ginger too and way more than a “pinch” of pepper. I stir-fried some broccoli, red peppers and sugar snap peas and added them in at the end. The “breading” on the chicken all came off in my stainless steel pan so I missed out on the crispiness of the chicken. But the flavors were wonderful and my kids loved it, even the one who doesn’t like to eat chicken. Served with brown rice. this was really good. I used my instant pot as a slow cooker – that way i was able to brown the chicken in the same pot and save all of that flavorful fond that sticks to the bottom of the pan. It was a huge hit in our family. Thanks! Tried the Orange Chicken recipe. Excellent flavor. But next time I’ll be doubling the sauce. Not near enough to slow cook in my crock pot. We ended up extending the sauce with items on hand to save the dish. It almost burned in 1 1/2 hours. I just made this for dinner. I liked it a lot and my son liked it ok, yet he grabbed seconds. This is not a Chinese fast food style breaded orange chicken but what you would expect in a restaurant. Next time I would prob add garlic and Asian seasoning from PC. I believe her chicken looks thick crusted due to the browning process. I had a section of a couple of pieces that looked the same. I did double the recipe as I was afraid the sauce would dry up and burn. I added onion and bell pepper about half and hour before we ate. It cooked for about 3 hours total. This was my first everslow cooker Chinese dish. I will make it again. Thank you ? P.s. I had trouble giving a star rating but I switched browsers and it worked fine. Alyssa, Is it possible to fry the chicken to completion and then boil the sauce and coat it to eat instead of putting it in the slow cooker? Have you tried this? I tried this one and it is the first time in all the years I’ve used a slow cooker where the food burned and the chicken tasted rubbery. The flavors were great, just wondering if anyone else had this experience and if the recipe could be modified?